Sorry the ice-cream look a bit hideous. I have no time to wait for it to thaw (so that I can make beautiful round shape) as the evening light is dimming. 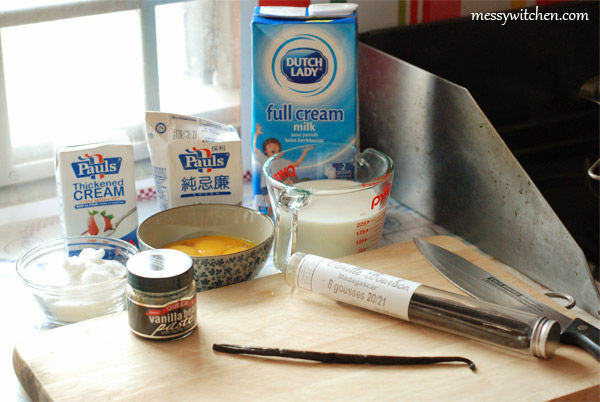 Ingredients for making vanilla ice-cream. Since this recipes uses quite a few egg yolks, I store all the unused egg whites in an ice cubes tray for future use (e.g. macaron). Add milk, 250ml heavy cream, salt and sugar in a saucepan. Then add the scraped vanilla beans. Add the vanilla bean pod as well as it still has many flavours in it. Heat the mixture. Once mixture is warm, remove from heat and leave aside for one hour (for infusion). Meanwhile pour remaining 250ml heavy cream into a bowl and set a strainer over the top. In another bowl, whisk the egg yolks. While rewarming the milk, make an ice bath: place 2L bowl in a larger bowl that’s been filled with ice and water. Once mixture is warm, pour slowly some of the warm milk+heavy cream mixture into the yolks while whisking constantly with another hand. Then pour the warmed yolks and milk+heavy cream mixture back into the saucepan. Warm the milk+heavy cream mixture in low heat. 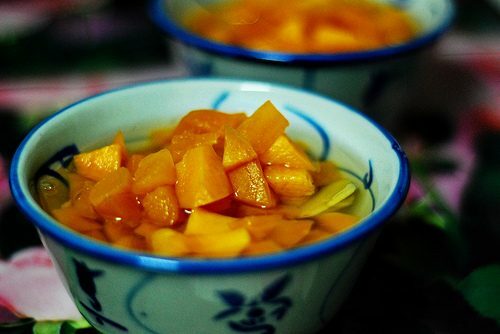 Stir constantly and scrape the bottom of the bowl to prevent mixture from sticking to the saucepan. 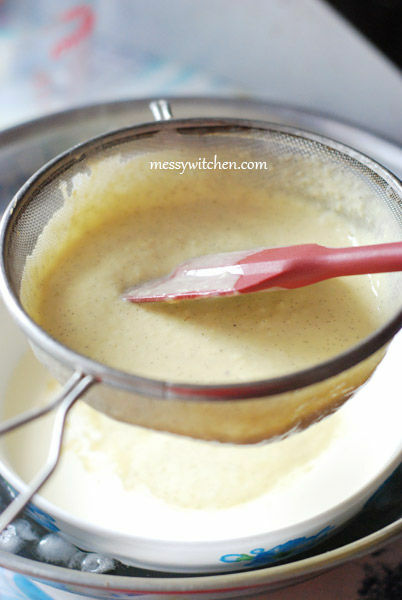 Heat the custard until it thickens and are able to coat the spatula. Strain the custard into the 250ml heavy cream over the ice bath. As you can see above my custard is lumpy. I must have missed my timing during the custard warming process as I was busy snapping. Don’t throw the vanilla pod yet. Add back to the custard. So it took a little bit of extra time to make all the custard go through the sieve. Add vanilla extract and stir the mixture thoroughly. Basically I just let it cool in the ice bath for awhile (like 10 mins) without stirring. Uhmm lazy. Before refrigerating overnight, I add a plastic wrap on the custard surface to prevent skin from forming (just in case). Make sure the wrap is touching the custard surface ya. Tsk I gave the custard a try and it taste just like the vanilla custard tart I made before. First, remove the vanilla pod (don’t throw it away. Read on to see suggestion how I recycled it below). 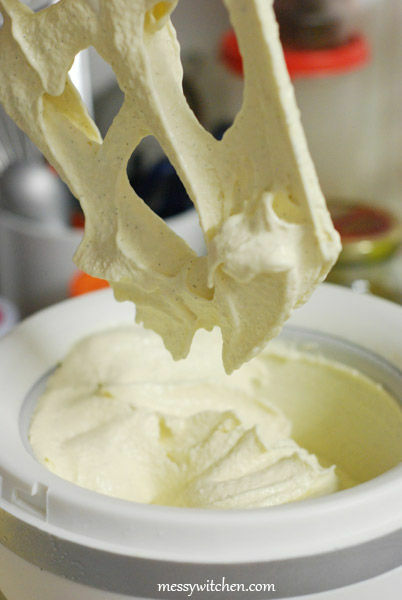 Then churn the custard in your ice-cream maker following the manufacturer’s instructions. After about 25 minutes of churning, I decided to turn it off. I’m not sure if this is okay, but I got a feeling I just made ice-cream. 🙂 According to Kenwood, the ice-cream produced should be soft spoonable type. I then transfer the ice-cream into a container for storage in the freezer. For the used vanilla bean pod, don’t throw it away. Rinse and dried, then stored in a container of sugar to make vanilla sugar. Ahh… my vanilla ice-cream is a success! 1. 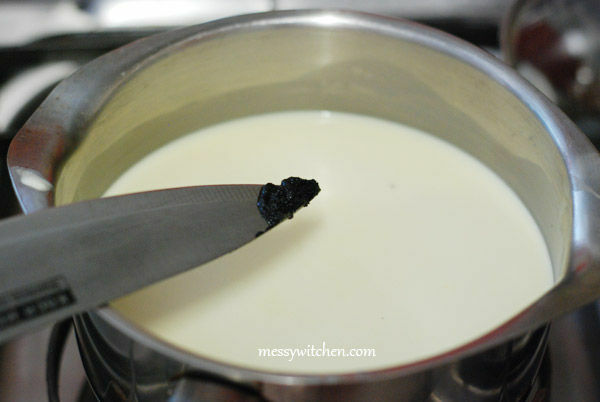 Place milk, 250ml heavy cream, salt and sugar in a saucepan and heat it. Add seeds of vanilla bean and pod into mixture. 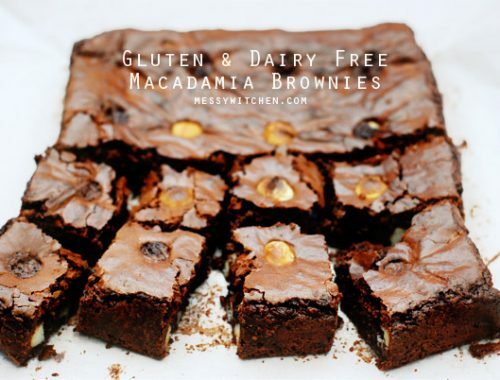 Once warm, remove from heat and set aside for one hour to infuse the mixture. 2. 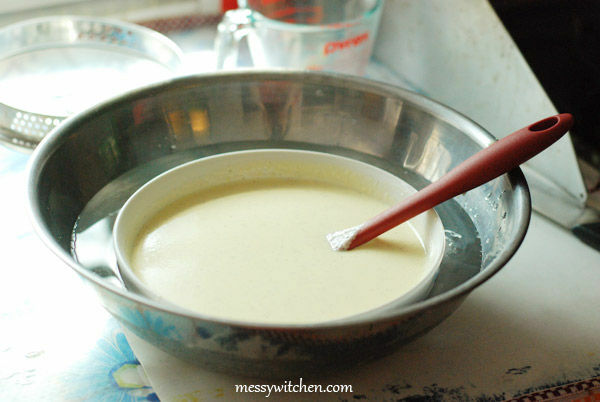 Pour remaining 250ml heavy cream into a bowl and place a strainer over the top. 3. In another bowl, whisk egg yolks. Reheat the milk+heavy cream mixture and then slowly pour some of the mixture into the egg yolks while whisking constantly. Pour the egg yolks and milk+heavy cream mixture back into the saucepan. 4. 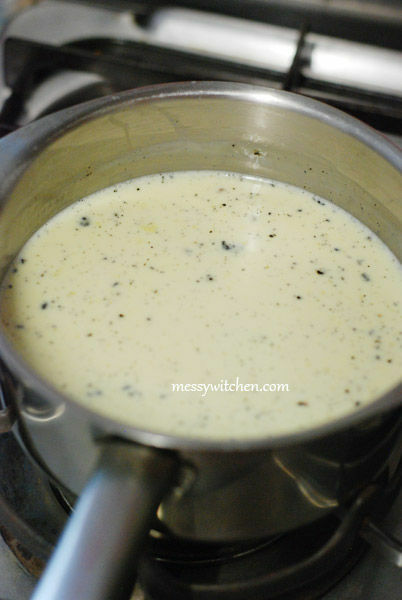 Warm the milk+heavy cream mixture in low heat. Stir constantly and scrape the bottom of the bowl to prevent mixture from sticking to the saucepan. 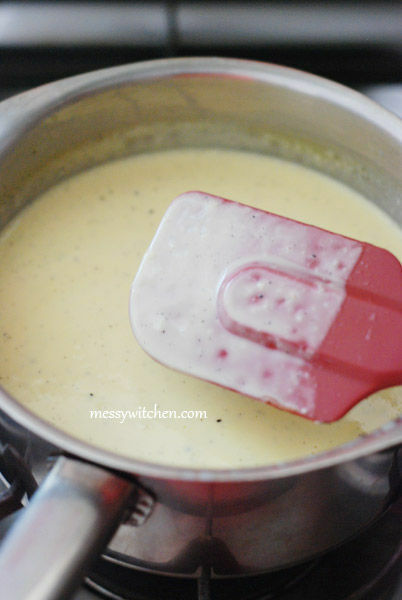 Once custard thickens and coats the spatula, remove from heat. 5. Strain custard into 250ml heavy cream (prepared earlier) over an ice bath. Add back the vanilla pod into the custard. Then add vanilla extract and stir until combined. Let custard cool in the ice bath. Then refrigerate to fully chill it (overnight is better). 6. 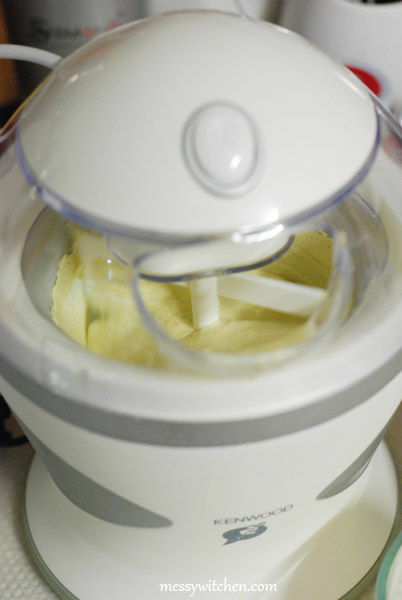 Remove vanilla pod and churn the custard in the ice cream maker following manufacturer’s instructions. you add the vanilla pod jor why still need the extract? Haha. 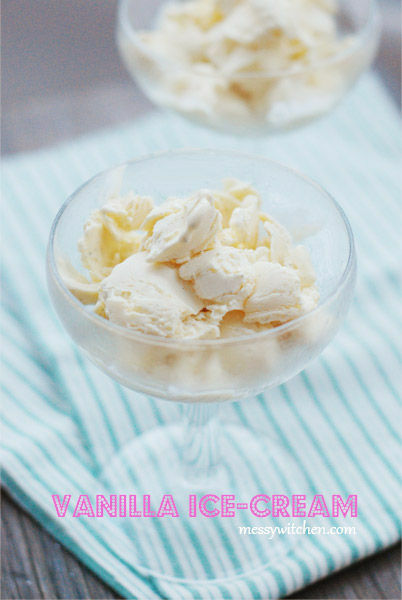 The taste is just like any normal vanilla ice-cream but more custard-y and vanilla-y. 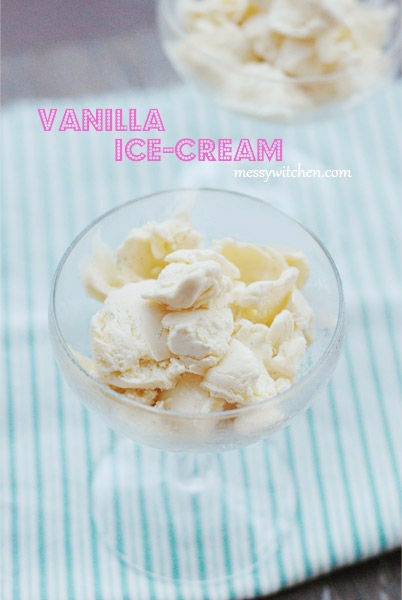 According to David: I use both a bean and vanilla extract in my ice cream since I find they’re slightly different flavors and each compliments the other. Fyi, vanilla pod is vanilla itself but vanilla extract is vanilla+alcohol. 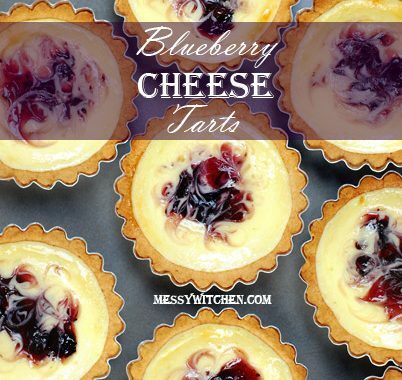 This particular recipe is custard based therefore need more steps.